Situated on a highly desirable 1/3-acre corner lot in the heart of Sunrise Park, Burton House features four bedrooms and three full baths with over 2,300 square feet of indoor living space. Built in 1958, the “boomerang” shape of Burton House is a tribute to its era and provides fabulous separation of living space and guest quarters. Featuring dual master suites and expansive common areas both indoors and out, this Palm Springs vacation home allows all guests to relax either as a group or on their own. Many of the architectural design elements of Burton House are attributed to the work of the notable Paul R. Williams, with his influences seen throughout the home. 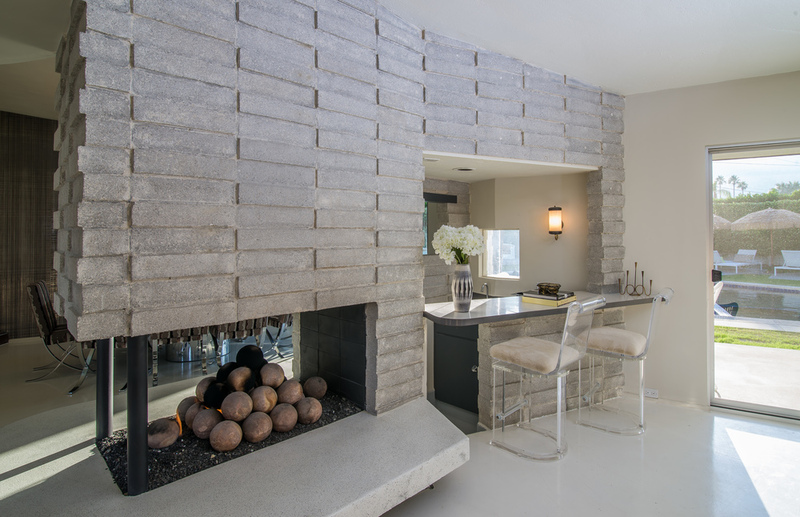 Burton House was featured during Modernism Week 2013 and covered by Interiors Magazine. The Master Suite is located on the southern end of the home. An extremely rare Paul Evans Cityscape bed finished in mirrored chrome anchors this suite. This custom King sized bed features built-in lighting and sheer curtains that can be drawn on three sides for the ultimate in fabulousness! The Master Suite also offers a sitting area, Flat Screen TV and en-suite bath with dual vanities, roman tub/shower combination and access to the pool patio from the bath or sliding glass door in the Master Suite. The Second Master Suite is located at the northern end of the home and features a Queen sized bed, Flat Screen TV, and en-suite bath with custom wall coverings, single vanity and shower. This suite features direct access to the pool patio, perfect for late night swimming or soaks in the spa. The Second Master Suite features a giant print of “Poolside Gossip,” shot in 1970 by Slim Aarons, which became a symbol of modernism. The two additional Guest Quarters are located adjacent to the Master Suite and each feature Queen sized beds, Flat Screen TVs and furnishings chosen to compliment their “Jack and Jill” identities. A common bath between the two bedrooms features dual vanities and step-in tile and glass shower. This bathroom is also accessible from the hallway, for houseguest use. A St. Charles inspired kitchen is sure to awaken many levels of culinary genius. Featuring a full suite of modern Stainless Steel appliances from Thermador and Bosch, including refrigerator, gas cooktop, built-in oven, microwave and dishwasher- even the most experienced chef will find themselves perfectly at home. Once the meal is complete, guests can choose to dine at the dinette located in the kitchen, casually poolside or at the vintage Paul Evans stainless steel dining table, which will seat eight guests with ease. Should guests wish to barbecue, a stainless steel natural gas grill is located adjacent to the pool. A large covered patio extends from the house, with comfortable shaded seating looking onto the pool and spa, with the mountains rising from the West. Multiple conversational areas surround the pool, with chaise lounges, outdoor couches and umbrellas providing space for all guests to enjoy the coveted Desert lifestyle. A large freestanding gas fire feature is perfect as dusk falls, bringing light and warmth to the outdoors.